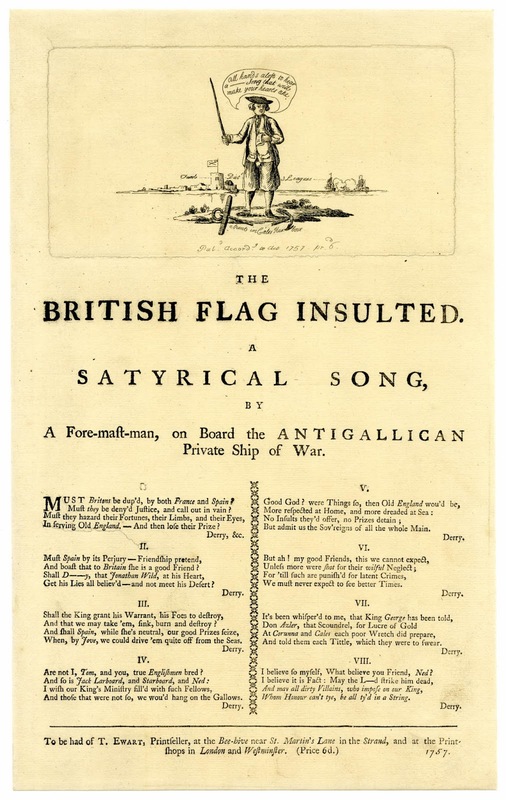 The British Flag Insulted, a Satyrical Song by a Fore-mast-man, on Board the ANTIGALLICAN Private Ship of War, T. Ewart, 1757, British Museum. Many images of sailors aren't explicit is precisely what kind of sailors they are. This is either because the context makes it clear (if a sailor is thrashing a caricature of France, we can safely assume he's naval) or because they were fairly interchangeable in appearance. Although there were many degrees of sailors, for our purposes we can put them into three broad categories: merchant sailors (working aboard import/export vessels, whalers, slave ships, etc. ), naval sailors, and privateers. Privateers were distinguished from naval sailors in that they worked aboard private vessels licensed to attack enemy vessels by a Letter of Marque. It is worth noting that sailors moved freely between these roles. Merchantmen could join a privateer vessel in search of money, or join the navy in search of a bounty, or be kidnapped by press gangs to join naval vessels short on men. Similarly, naval sailors could desert for merchant vessels to avoid the strictures of naval life, or for a higher profit if their cruise was proving unprofitable. With such fluidity, there was a common maritime culture among sailors of all types, and rarely did they remain fixed in a single role for their entire career. Dress was (largely) a commonality in this culture. The character here is a privateer. He stuffs a paper into his waistcoat (possibly a Letter of Marque) and stands over a broken anchor while two ships trade broadsides in the background, under the guns of a fort. His cocked hat is fairly wide, but short. It is difficult to tell if it is cocked over the left eye or turned about backward. Notably, his hair is short, but turned into side curls. The short jacket ends just at the top of his thigh, but is too small to determine the arrangement or type of buttons. We can say that it is with slash cuffs, left open. His neckcloth is tucked into the single breasted waistcoat, which ends below the waist, and is with waist pockets and pocket flaps. 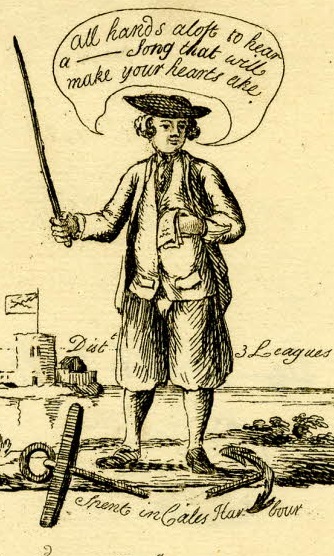 Unlike many other sailors, this privateer is wearing a waistcoat that was fairly typical in its cut, and only somewhat shorter than those worn in other professions. The slops end below the knee, and he wears stockings and round toed shoes.